Carell is a plain-old nice-guy movie star, the only one around who radiates decency and parlays it into comedy. He showed that in The 40 Year-Old Virgin. So he seemed a natural for this spin-off from the 2003 Jim Carrey hit Bruce Almighty. Where Carrey made a deal with God (Freeman) to run the world, Carell's Evan would be told to build an ark, Noah-style, and to populate it with two of every animal species, in preparation for a coming flood. And yes, Evan does; and yes, there is a flood (though we never learn why African animals are essential to the survival of humans in suburban Washington, D.C.). But the gags come in as a trickle, and almost all of these involve Carell being shat upon. Costing a reported $175 million  the all-time most expensive comedy  the movie had to huff and puff to earn $100 million at the domestic box office, and is considered this past summer's major floperoo. An honest DVD edition of the movie would include at least some damage assessment, but that's not in the nature of these self-congratulatory enterprises. 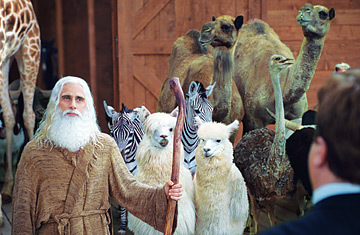 The Evan Almighty extras are the movie equivalent of, say, a New York Mets 2007 video retrospective showing how hard they worked and how well they played in April and May. So we get lots of flashbacks, some of them amusing, to the animals' "casting" and on-set misbehavior. "There was a lot of pooping on me," Carell says. "There was a lot of spitting on me. And that was just Morgan Freeman." Mishaps including an elephant sitting on Carell. "And you know what?" he observes, "They are a lot heavier than they look." As the crew learned, it's hard to direct wild animals. "They're not Al Pacinos," notes Wanda Sykes (whose performance brought some welcome saltiness to the movie's bland stew). "They're alpacas." The film's makers are proud of its uplifting subtext: that ARK stands for Acts of Random Kindness, which all should be encouraged to perform. (Some cast members count the ways they've paid it forward.) The producers went further, trying to leave a green footprint by riding bikes to work and planting trees in a forest near the location. There's also a brief commercial for General Electric, the parent company of Universal Pictures. You know what? GE is very green too. I'm pleased that the people behind the movie are as nice as Steve Carell seems. But amid all the edifying extras, I miss what could have been a dynamite commentary track revealing another important inside story. "Hi, I'm Steve Carell, and I'm here to explain how a cute idea went so spectacularly, expensively wrong." Wouldn't you pay for that?